It’s Easter time which means A LOT of sugar for the kiddies. I know my girls are going to get plenty of candy and chocolate at school and from family, so I really don’t want to add to the sugar overload. Having said that, I still want to give them a couple of homemade treats. You may have seen those Easter egg nest cookies making the rounds lately. You know, the nests made from chocolate and coconut then filled with jellybeans or candy-coated chocolate eggs? Neat idea, but too much sugar! I decided to make a paleo-friendly, dairy-free, and lower-sugar version for my girls. I used dark chocolate and unsweetened coconut, and raspberries instead of candy. 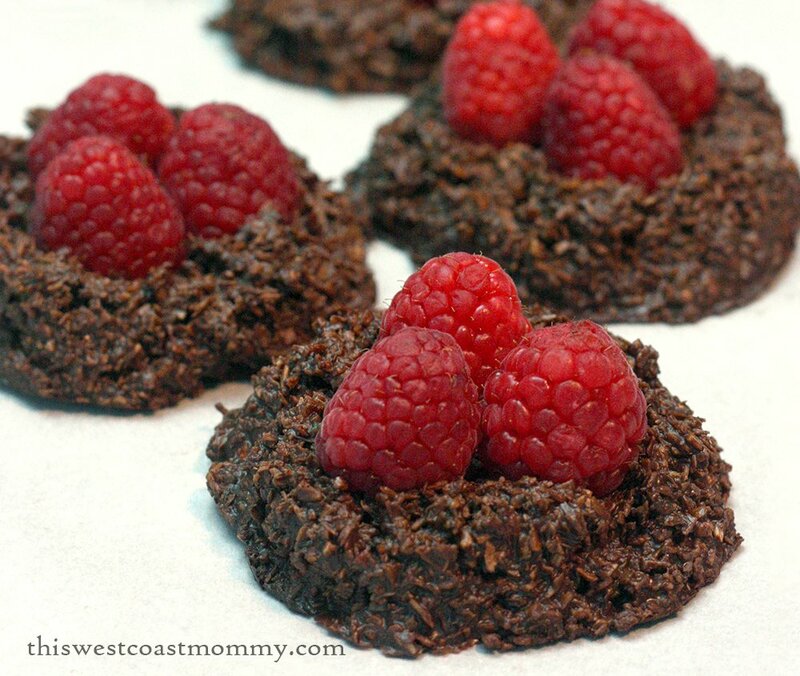 The tart raspberries go wonderfully well with the sweet chocolate and rich coconut. 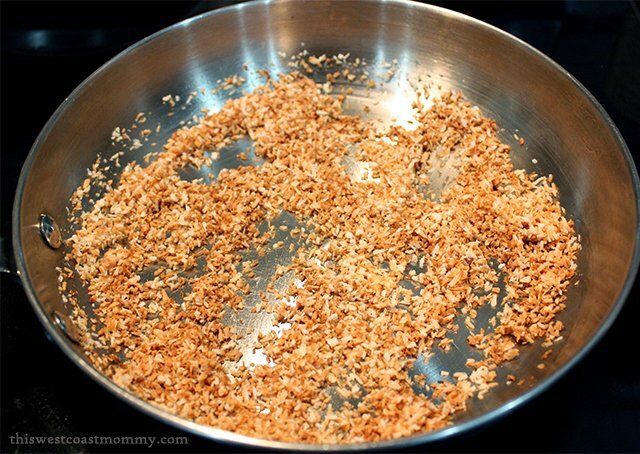 Start by toasting your unsweetened shredded coconut until it’s golden brown and crispy. You can toast shredded coconut on the stove top or in the oven. I prefer the stove top method because it’s quicker and easier for me (I’m all about the easy). Just toss the coconut in a skillet and toast it over medium heat for 5-7 minutes, stirring frequently until the coconut is golden brown. You can also toast coconut in the oven if you prefer. Preheat your oven to 300 degrees and spread the coconut in a thin layer on a baking pan. Toast for about 10-20 minutes until golden brown, stirring regularly. Next melt two 100 gram (3.5 oz.) bars of 70% dark chocolate. You could use a double boiler to do this, but it’s simpler to do it in the microwave. Break the chocolate into small pieces, place it in a microwave-safe bowl, and heat it on medium in short bursts of no more than 30-45 seconds. All microwaves differ, so check your chocolate each time and adjust accordingly. As the chocolate starts to melt, stir it after every time and nuke it on shorter time increments. Stop heating when the chocolate is almost melted and allow the heat of the already melted chocolate to finish the job while you stir. Stir in a touch of vanilla extract then mix in the toasted coconut. Drop spoonfuls of the chocolate coconut mixture on a sheet of parchment paper laid out on a cookie sheet. I was able to make eight nests with my mixture. Press the back of the spoon to make a depression in the middle. Use your fingers if necessary to help make the nest shape. Put three washed, drained, and dried raspberries in the centre for your eggs. I also made some with macadamia nuts as another paleo-friendly alternative to the candy eggs. Refrigerate the cookies for at least a couple of hours before serving. Substitute macadamia nuts or raspberries for those candy eggs! Toast shredded coconut in skillet over medium heat. Stir constantly approximately 5-7 minutes until golden brown. Melt chocolate in a microwave-safe bowl in the microwave on medium in 30-45 second increments. Stir after each time. Shorten time as chocolate melts, and stop heating when chocolate almost melted. Stir until chocolate is completely melted and smooth. Add vanilla extract and toasted coconut, and mix well. Drop large spoonfuls of the chocolate coconut mixture on the parchment paper. Use the back of the spoon to make a depression in the middle of each spoonful. Place three washed, drained, and dried raspberries in the centre for your eggs. Refrigerate for at least 2 hours until fully solidified. Macadamia nuts or blueberries also work well as low sugar, paleo-friendly eggs in your Easter egg nests. Two of my favorite phrases: “no bake” and “dark chocolate”!! YUM! I am so making this for my kids. That’s one of the best things about these – they look a lot harder than they actually are. Yes! Hubby can’t eat gluten and he really likes these too. These look really yummy! My hubby is on a very low sugar diet and he could enjoy these too. Thanks for the recipe. I’d love to know what you think if you do end up making them. YOU ARE A GODSEND! This is amazing!!!! I am going to keep these on hand the rest of the week to stop myself from bingeing on cadbury eggs! LOL! 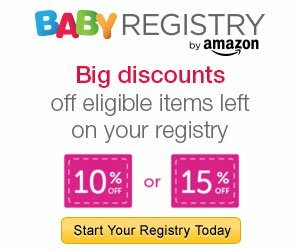 Yes, these are SO much better and better for you! OH my word, yum! These are my ideal dessert right here. Coconut, chocolate… LOVE! I also love that you suggest macadamia nuts too! Thanks so much for sharing with us at Delicious Dish Tuesday!! Wish I had these to eat right now! That looks really good! I might make them on Sunday! My oven’s still broken, so “no bake” caught my eye right away. Add in dark chocolate and I couldn’t click fast enough. These look awesome. I think I need to head out this afternoon to pick up some coconut and chocolate. Thanks, Deanna! I made a few batches of these to share with the extended family too. Hope you got to try some! I like the raspberries and nuts in place of candy eggs/jelly beans. Really cute, Olivia! Thank you for sharing and Happy Easter to you and your family. Thanks, Michelle. Hope you and yours had a wonderful holiday too! These look amazing and easy. Thanks for the recipe! Happy Easter Olivia. Great baking with the girls. Thanks, Karen. Hope you had a great holiday too! Featuring this for this week’s DDT!! 😀 Thanks so much for sharing with us! I have these on my list to make this week! Can’t wait!! Just found your recipe from this week’s Delicious Dish Tuesday and those cookies with those raspberries look SO yummy!! What an awesome idea! Look really good…will have to try this recipe out! 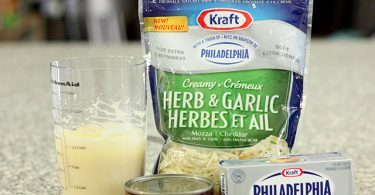 I am lactose intolerant so I enjoy dairy-free recipes! Thanks for sharing. 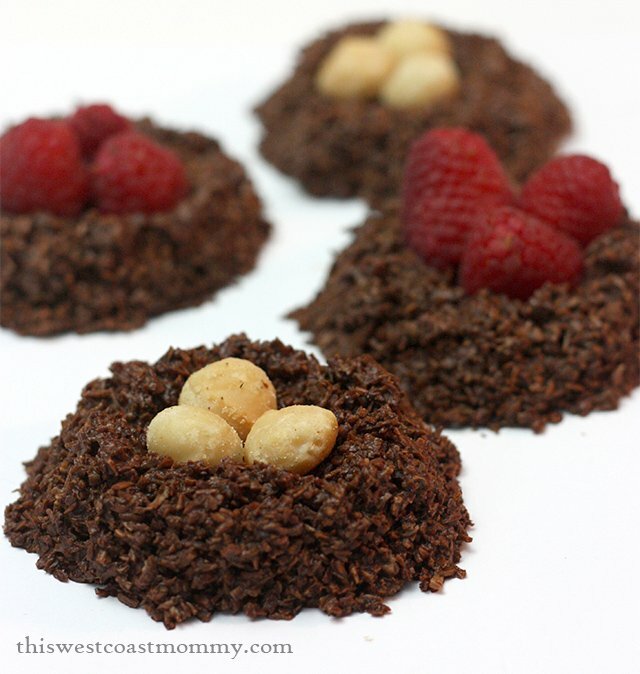 I think your No Bake Dark Chocolate Easter Egg Nest Cookies Recipe look delicious and are much healthier than the ones with more sugar and candy fillings. I think it is a wonderful substitute. wish I had seen this recipe earlier, they would have been perfect to take to my parents house for Easter dinner. Bookmarked. When I give this one a go, I’ll probably add nuts of some sort…. These look and sound really yummy! My mom used tomake something like these when I was a kid! 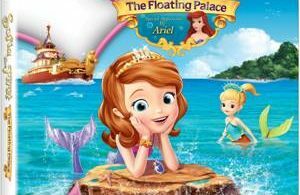 This looks so cute! I’m not a huge fan of coconut, but I think I’d like it! Definitely like the idea of “no bake” with summer coming up, thanks for the recipe! These look so good! Chocolate and raspberry are my favorite combo! these look so delicious i am so going to try to make them! Oh my I have to try these this weekend. They look so delicious! With the raspberries, these could also be Christmas treats. I am going to try them out this holiday season. Thanks! Nice! I’m always looking for paleo dessert food! 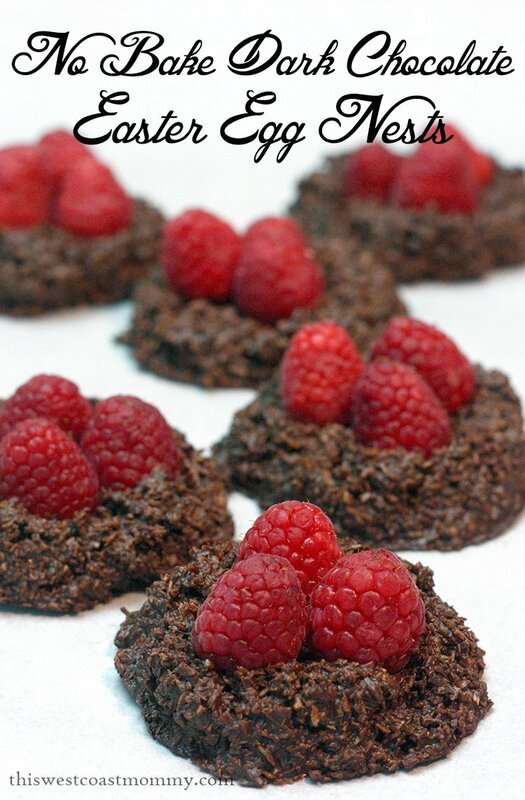 These little morsels of dark chocolate ,coconut and raspberries have me excited to try them.They look so delicious! These sound like a perfect little treat. Yes. I need these in my life. 🙂 Stopping by from This Is How We Roll! Wow!!! These have me drooling, lol.. 🙂 Love how easy the recipe is, they look amazing! Thanks for the recipe! Yum, I love this healthier alternative! I bet the raspberries and dark chocolate really compliment each other. Thanks for joining this weeks Creative K Kids’ Tasty Tuesday. I can’t wait to see what you share with us next week! These look cute and easy! I love chocolate with raspberries! Awesome, easter is coming up soon, these look easy to make!